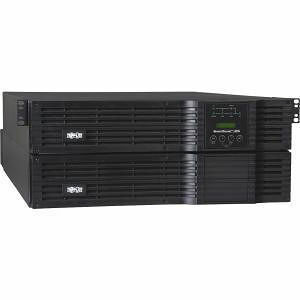 Tripp Lite 5kVA SmartOnline hot-swappable modular rack tower UPS 5000VA on-line, double-conversion UPS for server, network and telecommunications equipment. Uninterruptible Power Supply (UPS) maintains battery derived AC output during blackouts with active, full-time power conditioning. Fault tolerant auto-bypass prevents unexpected service interruptions during overload or internal fault conditions. Switches: Includes main power off/on switch, plus 2 switches to set and execute scrollable LCD functions. A manual bypass switch featured on the detachable PDU allows for complete removal of the UPS during routine maintenance without disrupting power to connected loads. Low voltage transfer to battery power: Maintains continuous operation during undervoltages as low as 65V (L1-N:L2-N). Below this point, output is maintained utilizing battery reserves. High voltage transfer to battery power: Maintains continuous operation during overvoltages to 140V (L1-N:L2-N). Above this point, output is maintained utilizing battery reserves. Cold Start: Yes, inverter can be "cold started" to enable temporary AC output during a power failure. Typical Applications: Ideal for protection of sensitive electronics in any application calling for upright tower or 19-inch rackmount UPS protection. Common applications include any mix of servers, workstations, hubs, routers, concentrators, IP telephony and traditional PBX switching systems.